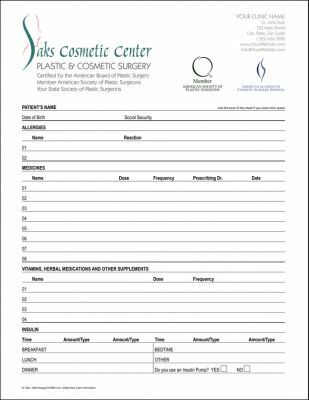 Forms for use in cosmetic practice centers, centers for cosmetic surgery, plastic surgeons, healthcare, medical offices. 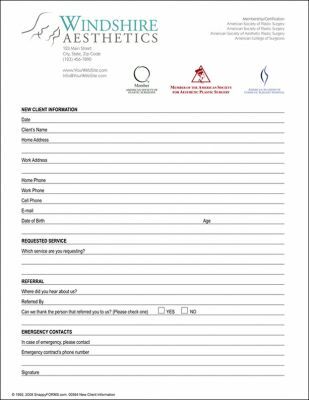 This New Client Information form can be used to obtain patient information as an intake or registration form. Its contemporary and clean design makes it easy for clients/patients to read and answer the questions. May be used as is, or easily editable using Microsoft Word to assist you in asking only the questions that you wish to obtain from your patients. With its contemporary design and host of features, it is sure to enhance any cosmetic practice or existing medical or doctor's office wanting to do away with their old patient intake forms and replace them with new, updated, contemporary forms without going through the expense of new form typesetting and offset printing fees. Print as many as you need and edit them as your office needs change in time. 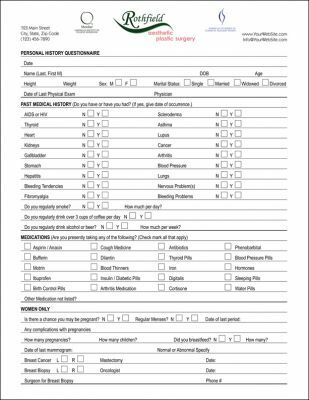 This form is used used to obtain new patient medical history. Form is divided into 4 sections. Patient information, past medical history, medications, and the last section is reserved for women only. May be used as is, or easily personalized to your individual needs, using compatible word processor. 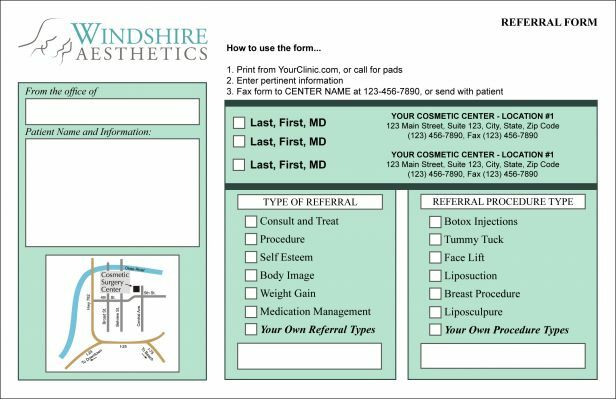 No need to design your form from scratch, with its contemporary design and host of features, it is sure to enhance any cosmetic practice or existing medical or doctor's office wanting to do away with their old patient intake forms and replace them with new, updated, contemporary forms without going through the expense of starting from a new form or form typesetting and offset printing fees. Print as many as you need and edit them as often as needed. 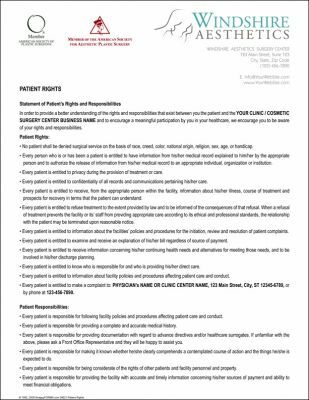 Provide your clients and customer with a welcoming letter showing that you respect their rights to dignity and pride with the Patient's Rights notice / handout. 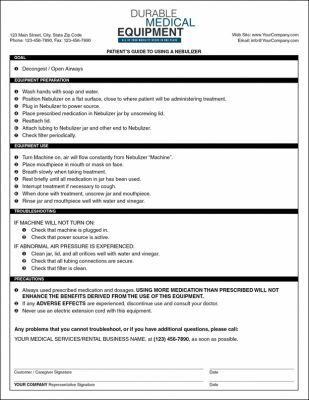 This form is used used to obtain new client or patient, allergy and medication information. It has room for patient's personal information, allergies, medicines, vitamins and other supplements and for any insulin taken and dosage, keep in mind that form fields can be edited using Microsoft Word or other word processor..
A medical release form is a document that gives healthcare professionals permission to share patient medical information with other parties. Patient's must first sign a release. Did You Know? 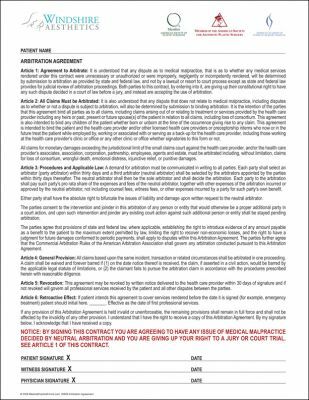 Verbal medical release agreements are not sufficient because they are impossible to verify if there’s ever a disagreement. Healthcare staff need a written copy on record with a signature to protect themselves. If you are ever instructed to share healthcare information on behalf of a patient, make sure you have them sign a release form. Avoid malpractice suits that can tarnish the physician's reputation and raise malpractice insurance premiums by having your client accept binding arbitration of any dispute, avoiding the client's right to a trial. 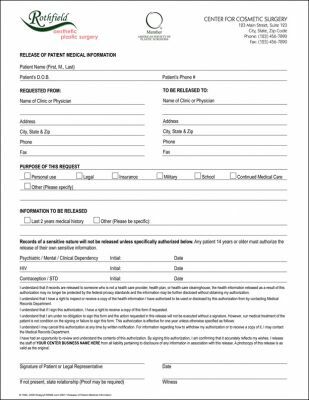 This release form is used to obtain client authorization to take photographs for use as an aid in patient's treatment. 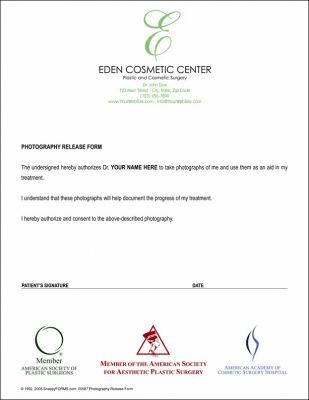 Protect yourself if you will be taking patient photographs, be sure to obtain your client's permission in writing. Form uses industry standard, legal wording section and may be fully edited or modified using Microsoft Word or other word processors. Our referral card provides information that is easy to read and understand for you and your referring doctor. Layout is tailored to your practice and the specific services you offer. Easily edit using Microsoft Word and print from your office in regular bond paper or thicker stock, print as many as you need. 2 will fit on 8.5" x 11" letter size paper. A patient's guide to using a Nebulizer. Includes sections and guidelines on: goals, equipment preparation, equipment usage, troubleshooting and safety precautions and additional medication precautions. It also has a section near bottom of form with the medical equipment's business name and a telephone number for the patient have difficulty, needs assistance or does not understand something. Tip: Protect your medical supply rental business, be sure you have outlined safety precautions to the patient and leave a safety guidelines sheet with any type of medical rental equipment left in location with a patient or caregiver. Botox® Treatment Consent to Treat a Minor Form. The parent or guardian of a minor, authorizes physician to perform cosmetic treatment and is disclosed information concerning Botox, how it injected, side effects, what to expect, patient also acknowledges the limitations of Botox treatments and possible side effects and dangers. Patient consent date and signature signature lines at bottom of form. Physician should examine form to see if it may benefit his/her practice to help keep patients legally informed and physician from legal problems. 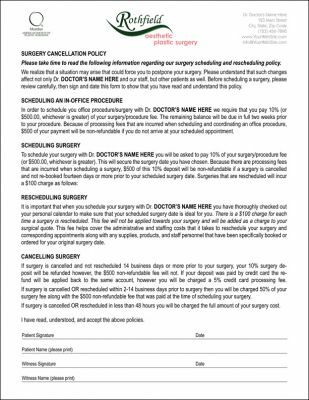 Medical Practice Surgery Cancellation Policy, provides information regarding the physician's surgery scheduling and rescheduling policy. It covers areas for scheduling an in-office procedure, scheduling surgery, rescheduling surgery can cancelling surgery, plus fees associated. Acceptance date and signature lines at bottom of form. General guidelines to using a Walker. A patient's and caregiver guide to using a walking. 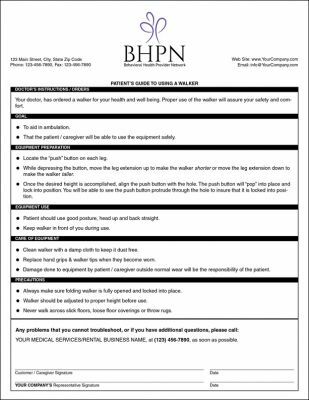 Protect yourself, be sure you have outlined safety precautions to the patient and leave a safety guidelines sheet with the walker.